For all his many accomplishments, Rob Cronin takes little credit for himself. Instead, when discussing his life, he repeatedly refers to other people. His parents, his business partners, the beneficiaries of his philanthropy and especially his wife all figure prominently into his view of how he became the man he is. "I have such an advantage," he said. "I'm two people: my wife and I. She's unbelievable." Good people around him and self-motivation within him—these are the driving forces behind the Idaho Mountain Express' first Valley Man. Arriving for a meeting, Cronin admits he held a phone meeting on his drive from Hailey to Ketchum. "I'd rather be too busy than not busy at all," he said. A full schedule is nothing new to him. As a child, his parents instilled in him values that would shape his life. "Work and family were our two biggest focuses," he said. Paid jobs mowing lawns and washing dishes were interspersed with volunteer stints with his parents and sisters at soup kitchens and other places of need. He said that being around different segments of society taught him to feel comfortable with people who were different from him. That experience later enabled him to interact easily with young cancer survivors at Camp Rainbow Gold, where he has volunteered as co-director for the past decade. "I got over the fear of the less fortunate at an early age," he said. Throughout his youth, most nights ended with the family gathered around the dinner table, a practice he credits with giving him a solid foundation. When he met his future wife, Kris, he saw in her a partner who could match his enthusiasm for productivity. "It was pretty easy when we got together," he said. Her work ethic matched his work ethic, one he describes as an "overwork ethic." "We're very compatible," he said. "She's truly my best friend and my soul mate." Cronin is a well-known figure in the Wood River Valley's restaurant and real estate scenes. He honed his business skills at restaurants across the country—he was the first employee hired by Planet Hollywood—and opened The Mint and Dyn-o-mite Lounge on Hailey's Main Street for actor Bruce Willis. In 1999, he came back to the valley to pursue his dream of running his own restaurant. He bought the Red Elephant Saloon in Hailey with Brendan Dennehy and later owned Viva Taqueria. 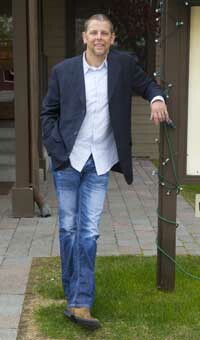 In 2002, he and his partners opened Zou 75, an Asian restaurant/martini bar in Hailey. Cronin's other position as managing partner at Sun Valley Brokers ensures that his days are filled with activity. Though real estate and restaurant administration take up the bulk of his days, and restaurant operations occupy him at night, he doesn't feel overextended. Without hesitation, he credits others: Brendan and Ramie Dennehy at Zou 75 and Katherine Rixon and Rob Hogan at Sun Valley Brokers. "I have great partners in both businesses," he said. "As of this very moment, we've got five different real estate deals going on. My partners are working away. Things are getting done." In his 20s, Cronin applied himself to his career with his usual zeal. He spent long hours and late nights running restaurants in New York City, Las Vegas and Orlando, with the pursuit of fun also on his mind. Priorities came into clearer focus when he was diagnosed with cancer at age 30. "When I got sick I realized, 'Did I just waste away everything I was raised to be?'" he said. "It changed everything." He didn't wait long to shift focus. "I vowed to give back and pay it forward if I was allowed to live," he said. Rob and Kris founded the Share Your Heart Ball, the main funding source for the Camp Rainbow Gold program—an annual summer gathering north of Ketchum. Cronin points to his wife's skills at donor relations and her attention to detail as key to the camp's success. "I'm constantly inspired by how hard she works," he said. "She's been a phenomenal force." As one who surrounds himself with people with a strong work ethic and integrity, he seeks the same in himself—a habit that sometimes leads to a feeling of insecurity. "I hold myself to this insane standard," he said. "I almost feel like I'm never doing enough. That drives me, too. I should probably feel comfortable with the fact that I have a successful real estate business, I have a successful restaurant and a successful camp. But I always feel like I need to be doing more. Maybe I'm not touching enough people." While not everyone has the support system—or the energy—that Cronin can count on, he says anyone can gain the benefits of altruism. "It's never too late to start giving," he said. "The most important thing you can give is of yourself: your time, your energy." Cronin says there is no better feeling than when someone tells him he has been a positive influence in his or her life. "Once somebody starts giving of themselves and starts putting their energy in a positive direction, it can't help but come back to (them)," he said.